It's nice to get packages in the mail, it makes you feel special and it makes you feel like it's Christmas all over again. With Mail A Tale your little one can enjoy getting monthly packages in the mail just for them. Mailatale is a subscription-based service that curates monthly children's book boxes. Their packages are designed to excite children about reading and offer convenience for busy parents. Each package is personalized, age-perfect, and centred around a monthly theme suited for children aged birth to 10. Subscriptions are $28.95 per month with FREE shipping across Canada. Members also receive FULL Canadian retail value in books (2-3 books per month). How cool is that?! A monthly subscription that sends your child books and encourages them to read on a daily basis. When I got the opportunity to have books sent to my little one I knew she would be thrilled. She is only six and is a book lover and an avid reader. She's constantly reading and she loves explaining the books she reads to myself and the hubby. When we got her package in the mail, I let her open it. Not only was it wrapped nicely, the post card that was sent was addressed to her from the company letting her know that they hoped she'd enjoy the two books that were sent to her because they picked them out especially for her. Let me tell you, she absolutely did. 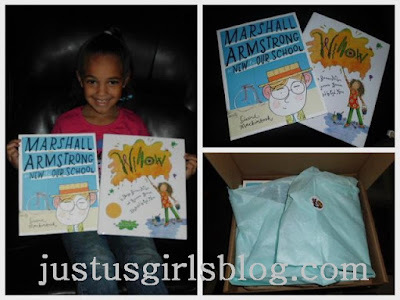 The two books she received were Willow and Marshall Armstrong Is New To Our School. Both books were completely different from one another yet she related to both and loved both. She told me Marshall Armstrong Is New To Our School reminded her of the first day of school. I loved that Mail A Tail was able to send two books that were perfect for her age and that she related to both books. Want to know more about Mail A Tale, visit them on their site and also look for them on facebook and twitter. Thanks to Mail A Tale the readers of Just Us Girls are getting a discount on your first month subscription, you'll get $10 off, how awesome is that?! Just enter the code JustUsGirls10 and you'll get your first month for just $18.95. Disclosure: All opinions are my own. I received a Mail A Tale package at no cost for the purpose of this review. No other compensation was received.